HONOLULU -- The summits of Hawaii’s Big Island could get more than two feet of snow, with a winter storm warning in effect through Saturday. A Winter Storm Warning is in effect through Saturday evening for elevations above 11,000 feet. The summits could get 20 to 30 inches of snow through Saturday, CBS affiliate KGMB. Conditions on the summits are dangerous. Besides being cold, east to southeast winds of 10 to 20 miles per hour are expected with higher gusts. The strong winds also will cause drifting snow, and freezing fog will reduce visibility to as low as a quarter of a mile. It may be a while before you can see the white stuff up close. 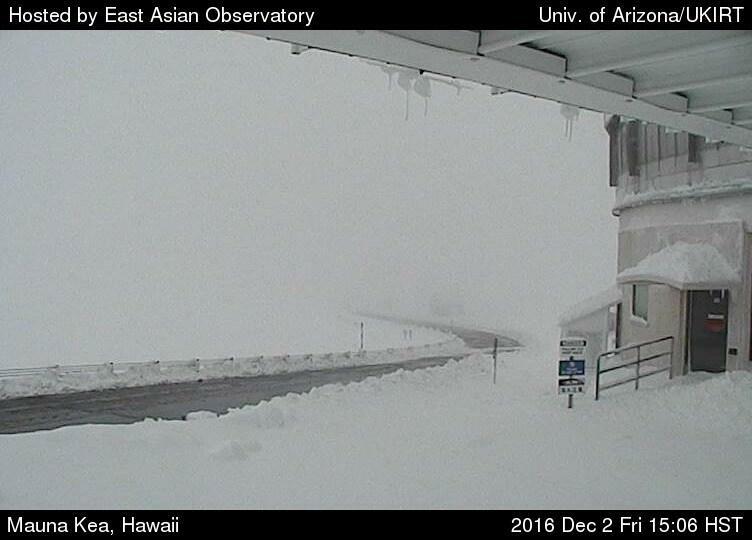 The road to the summit of Mauna Kea is closed at the Visitor Information Station at the 9,200-foot level due to freezing fog, heavy snow and icy roadways. The summit of Mauna Loa is also closed due to high winds and heavy snow. This means hiking and overnight camping is prohibited. The National Park Service said a thick blanket of snow was visible as low as 10,000 feet. Yes, it snows in Hawaii, Matthew Foster, a meteorologist with the National Weather Service in Honolulu, said he had to explain to some surprised out-of-state callers Friday. Once they realize the heights of the mountains, snow in the island state makes a little more sense, said Ryan Lyman, forecast meteorologist with the Mauna Kea Weather Center. Mauna Kea is nearly 14,000 feet above sea level. The weather service forecasts new accumulations of about a foot of snow Friday night through Saturday. An additional foot is possible Sunday. Temperatures are in the mid-20s to lower-30s. That’s a significant amount of snowfall, but not uncommon for the summits, meteorologists say. It’s enough snow to shut down operations on Mauna Kea, Lyman said. The mountain’s access road is expected to remain closed until next week, he said. The weather service doesn’t keep track of what the record amounts of snowfall are on the summits. Heavy snow is often accompanied by wind, which create drifts that make it difficult to accurately measure snowfall, Lyman said. Abundant snow on Mauna Loa’s 13,677-foot summit could be seen at sunset Thursday from parts of Hawaii Volcanoes National Park, said park spokeswoman Jessica Ferracane. There was heavy rain in other parts of the state Friday, with a flash flood warning in effect for Oahu, Kauai and the Big Island.